This is a fantastic deal and it won’t last long…The Language Builder Flashcard Bundle contains 3 sets of cards at savings of over $100! 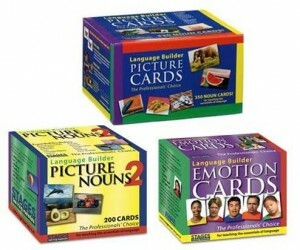 Normally, purchasing these top sellers individually costs $268.90 but this week only, wwe’re offering the Language Builder Picture Cards, Language Builder Picture Noun Cards Set 2, and the Photo Emotion Cards for $165.00 for ALL THREE! That’s over $100 in savings! To take advantage of this amazing offer, you must click on the links above! This special offer is only available to you – our readers -for one week! The offer ends on Tuesday, May 22, 2012 at 11:59 pm EST. Since it’s an exclusive offer, you must follow the links on this post to access the Language Builder Picture Card Flashcard Bundle on our site. 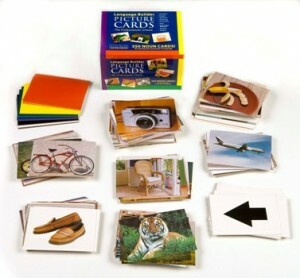 The Language Builder Card Sets are the most widely used photo language flashcards for teaching key language concepts to children and adults with autism, developmental delays, or speech/language delays. All of the cards measure the same 3 1/2″ x 5″ so coordinating the flashcards is a breeze. The Language Builder Picture Noun Cards contain 350 photographic flashcards for teaching key language concepts to children with autism or other speech and language delays. This set of vivid, beautiful noun cards was created by a parent and a therapist both personally experienced in the program needs of Applied Behavioral Analysis. The set includes images in nine basic categories: Animals, Foods, Vehicles, Furniture, Clothing, Toys, Everyday Objects, Shapes and Colors. Stage One is comprised of 105 cards that present two identical images on non-distracting white backgrounds. These basic cards foster matching, labeling and categorization skills. The remaining cards round out Stage Two, which presents the images in their natural settings, enabling children to conceptualize and generalize. In addition to fostering receptive and expressive language, these cards are also ideal for higher learning, including functions, story telling and more. On the back of each card is an easy to use system for tracking your child’s progress, including a list of possible program uses, with the date that each is introduced and mastered. Each set includes 57 foods, 39 animals, 27 vehicles, 31 clothing items, 24 furniture items, 39 familiar toys, 15 basic stages sets, 13 colors with duplicates, 12 shapes with duplicates and 83 additional objects familiar to your child. 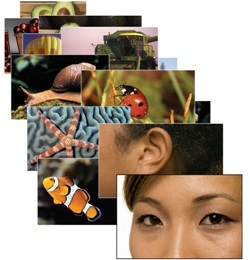 The Language Builder Picture Noun Cards Set 2 is a 200-Card set of photographic cards that offers additional vocabulary for students who have mastered the original Language Builder. Categories include Body Parts, Safety Signs, Tools, and Musical Instruments, along with over 100 additional cards to expand your set. This set is great for labeling practice, as well as sorting, adjectives, functions, things that go together, storytelling and more. 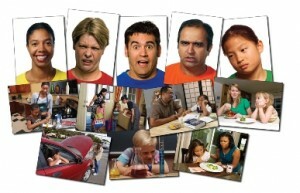 The Language Builder Photo Emotions depict facial expressions and emotions by presenting various scenarios featuring men and women of various ages and ethnicities. This 80-Card set will help students identify and discuss different feelings and emotions. Half of the images are presented against a plain background, showing only the upper body and face, clearly depicting a single emotion. The remaining cards show people engaging in real activities and situations in natural settings and contexts. This invites discussion about a range of emotions, why people may feel a certain way, and possible responses to these feelings. For the convenience of the instructor, the back of each card is numbered, provides a label for the featured image, and lists suggested activities for which the card is targeted. An included activity booklet provides more detailed instruction ideas. *This offer ends on Tuesday, May 22, 2012 at 11:59 pm EST. You must click on the links above to access the Bundle on our website. Written by: Different Roads to Learning on May 15, 2012. This entry was posted in ABA, Difflearn Promo Code, Pick of the Week, Products, Sale, Speech & Language and tagged ABA, Applied Behavior Analysis, autism education, autistic spectrum disorder, conversational skills, Different Roads to Learning, Early Intervention, Language Builder Picture Noun Cards, language development, learning, teaching, teaching tools by Different Roads to Learning. Bookmark the permalink.